Still all over the cookery book called Zest! (recipes from top 62 top Irish restaurants). Decided to cook another seafood-y risotto dish. This one is from The Lime Tree Restaurant in Kenmare. Heat the oil in a heavy-bottomed pan for 1 minute. Sweat the shallots and garlic without colouring. Add the wine and once hot add the Arborio rice. Stir constantly over a medium heat until the wine is absorbed. Then gradually add the stick little by little, stirring all the time ad softening the rice. Once all the stock is absorbed and the rice is cooked, add the chorizo and turn off the heat. 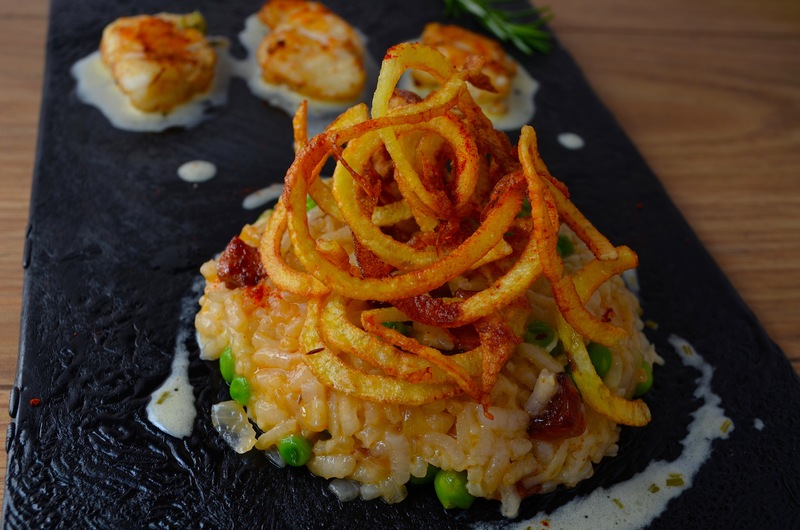 When ready to serve, finish the risotto by adding the garden peas, grated Parmesan and cream. Add the chopped rosemary leaves, wine vinegar and sugar to a pot to reduce by half. Add the cream, bring back to the boil and whisk in diced butter. Keep warm until ready o serve. Season the monkfish tail medallions with salt and pepper. Heat a little oil and butter in a pan. Add the monkfish tail and colour golden brown on both sides. Finish in the oven for 8 minutes. 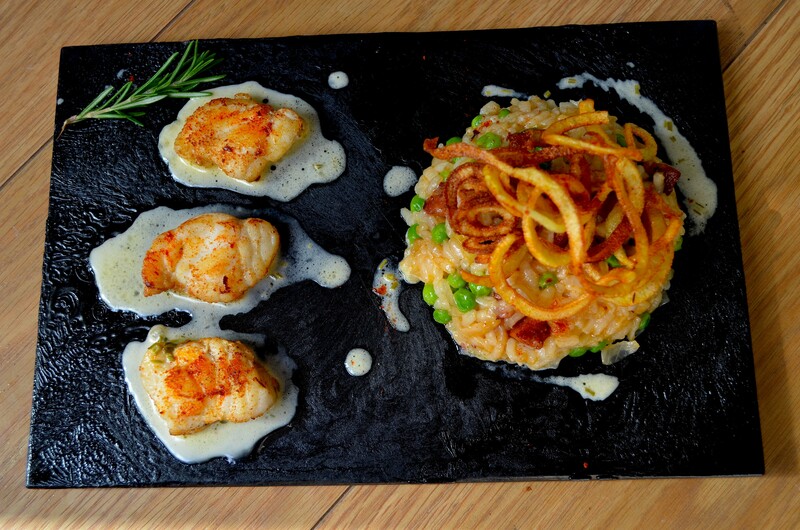 Place the risotto in the middle of warm plates. 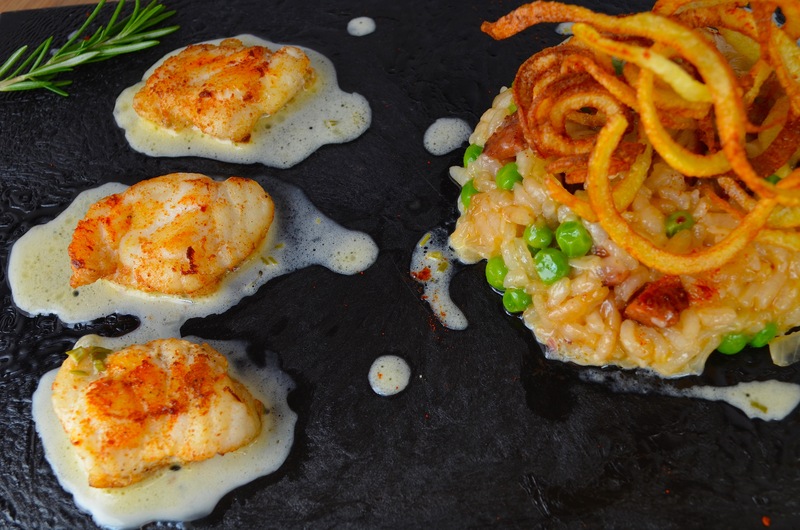 Drizzle the butter sauce around the risotto and then place the monkfish medallions in the butter sauce. This dish was absolutely delicious. Wine and rosemary flavours all the way through combined with smokiness of the chorizo. Very pleasant! 03 May	This entry was published on May 3, 2015 at 8:34 am. It’s filed under All the Recipes jumbled up!, SEAFOOD and tagged Irish food, Lime Tree restaurant, monkfish recipe, risotto recipe. Bookmark the permalink. Follow any comments here with the RSS feed for this post.